Our orthopedic doctors and staff at Manhattan Orthopedic Care, from the person who meets you at the reception to the nurses and surgeons, are trained to give you – the respected patient – the best-tailored care you need. But, we can not praise ourselves alone, we leave that to our satisfied patients, like Mrs. Eliza Vasquez whom we thank for these kind words! “I would like to take this opportunity to express my sincerest thanks to everyone for all of their help, guidance and care. 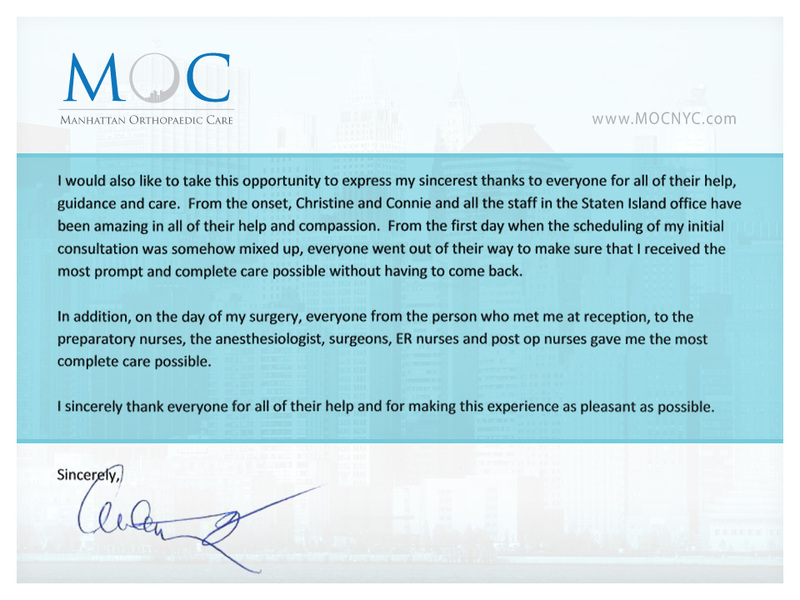 From the onset, Christine and Connie and all the staff in the Staten Island office have been amazing in all of their help and compassion. From the first day when the scheduling of my initial consultation was somehow mixed up, everyone went out of their way to make sure that I received the most prompt and complete care possible without having to come back.